Yes that's the correct part number though quite a hefty R8 tax on that offer. They are available to order from Audi dealers in the UK for ~£28. 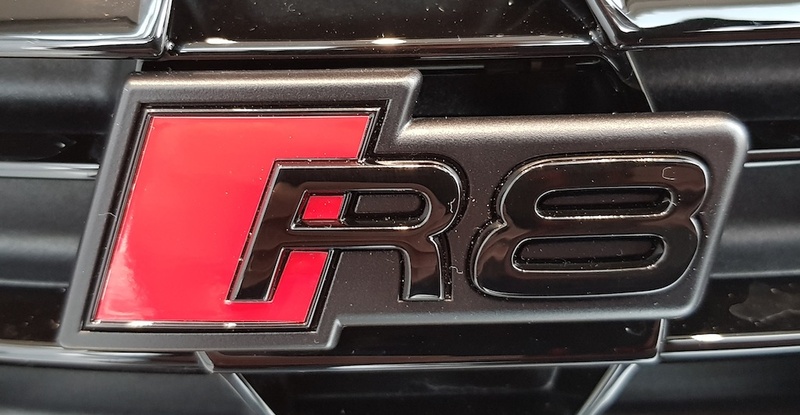 4S0 853 737 GT 94 Front R8 emblem gloss black. Does it just clip on? So i can remove the quattro badge with flossing wire and stick it in its place? Thanks Steve and Craig for the badge info. much appreciated. Never been a fan of fake vents on anything. I did 30 miles in my local UK dealer's brand new V10 Performance demonstrator today. It does sound more subdued than the previous model, particularly on the downshifts. It's lost some of the rasp and edge that it used to have. In neutral, revs are limited to 3,000 rpm. That's a shame. They probably want to ensure that the r8 is the cheaper Huracan alternative this generation that will not canibilize those sales, especially with the Evo just being released. I chose the R8 over the Huracan but they might be trying to push people into the Lambo with the more civilized exhaust of the R8. That’s hugely disappointing. Hopefully the US market won’t have to abide by the same design since we can get away with a lot more here. Otherwise, I foresee the aftermarket and tuning scene to get a lot of new business from facelift owners to open up the pipes a bit.